Greek Salad Recipes have always been a diet staple of mine because the flavors are SO good, and it’s easy to make a large, satisfying serving that doesn’t sacrifice the taste, but is still low in calories. By making your Greek Salad Dressing, instead of buying store bought, not only is it healthier, but is tastes SO fresh and delicious! With the added flavors of the Kalamata olives and the fat free Feta cheese, this salad tastes so good, it’s hard to believe it’s only 4 Points for a huge 3 cup serving. Though not an official one of Weight Watchers Salad Recipes, it’s the perfect healthy lunch idea or dinner for anyone counting calories but still wanting a filling dish. Finally, a filling salad recipe that is not only a great low calorie lunch idea, but tastes delicious too! 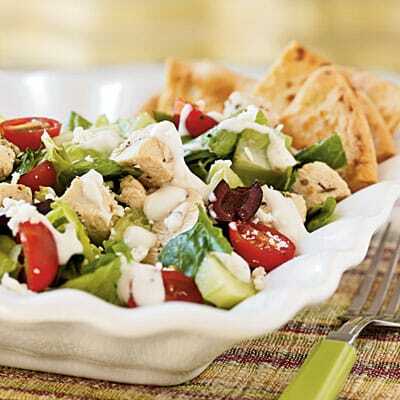 Made with fresh ingredients, and a homemade Greek Salad dressing recipe, this dish is sure to satisfy. And each 3 cup serving has just 4 Points! In a large bowl, whisk lemon juice, oil, oregano, salt and pepper together. Add remaining ingredients and toss to coat. OMG it was SO SO Good! Pinned it to share with my friends. Thank you! I was searching for something healthy for dinner tonight and I found this on pinterest. I have the chicken grilled and the salad all put together. I am serving this with pita pockets so my kids can make it into a sandwich. I will let you know how we liked it later.